It's not a secret that creating and monitoring follow-up email marketing can be time-consuming and in many cases require in-house development. Our automatic follow-up email process gives you more time to work "on" your business rather than "in" your business. Follow-up email marketing creates a predictable stream of customers that buy. Customers who have purchased in the last 72 hours may be more willing to respond to a targeted email than others. Customers who purchased three or more times in the last six months are more likely willing to respond than others. Customers who spent 50% more than your average client value last year are more likely to respond than others. Follow-up marketing will boost your closing rate, dramatically increase your customer satisfaction, and create an additional opportunity to engage with your customers and learn from them. Our comprehensive reporting helps measure and optimize follow-up email performance. 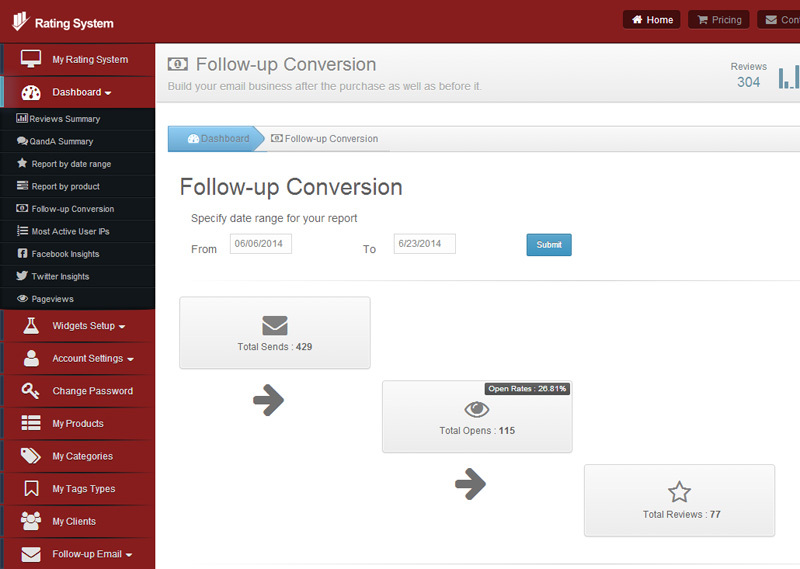 Total Sends - Total Sends measures the number of times a follow-up email is sent. Total Opens - Total Opens measures the number of times an email is opened. Monitor the total number of opens to your emails over time to better understand what is resonating with your audience when it comes the contents of your messaging. Open Rates – the Open Rates measures the total number of times an email is opened divided by the total amount of emails sent during a campaign resulting in a percentage of email’s opened; the most important metrics that help determine the success of your efforts. Total Reviews - total number of reviews submitted - a strong indication that your email list is engaged with your company. The point of follow-up emails is to increase the visibility of your brand and help increase revenue.